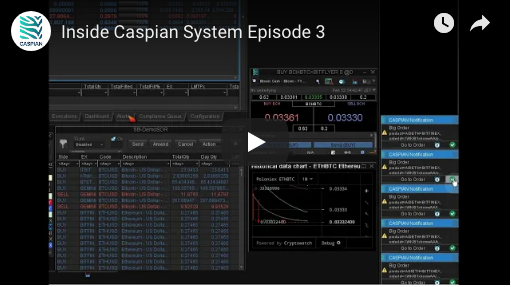 This is the third of the ‘Inside Caspian’ series of demo videos, which takes a detailed look at how the Caspian platform supports an end to end trade flow for sophisticated investors trading in cryptocurrencies. This episode looks at how our compliance engine can make your life easier without impacting your trading work flow. Caspian is a full-stack crypto asset management platform tying together the biggest crypto exchanges in a single interface. The platform also offers compliance, algorithms, portfolio management, risk and reporting. Led by an experienced team of developers, and leveraging the capabilities and resources of two existing, successful financial businesses as its co-build partners, Caspian is building an ecosystem that enables sophisticated traders to operate more efficiently and improve their performance.